On Wednesday, February 14, 2018, Manchester, NH Police Department received a donation from the New Hampshire Speedway Children's Charities and The Kennek Foundation. The donation is a direct result of the ongoing successful partnership between Speedway Children's Charities and The Kennek Foundation. Together, they have helped hundreds of local children by supporting First Responders in Manchester, Concord, Loudon and surrounding communities. The Manchester NH Police Department now has a new partner in its efforts to help local children going through difficult times. 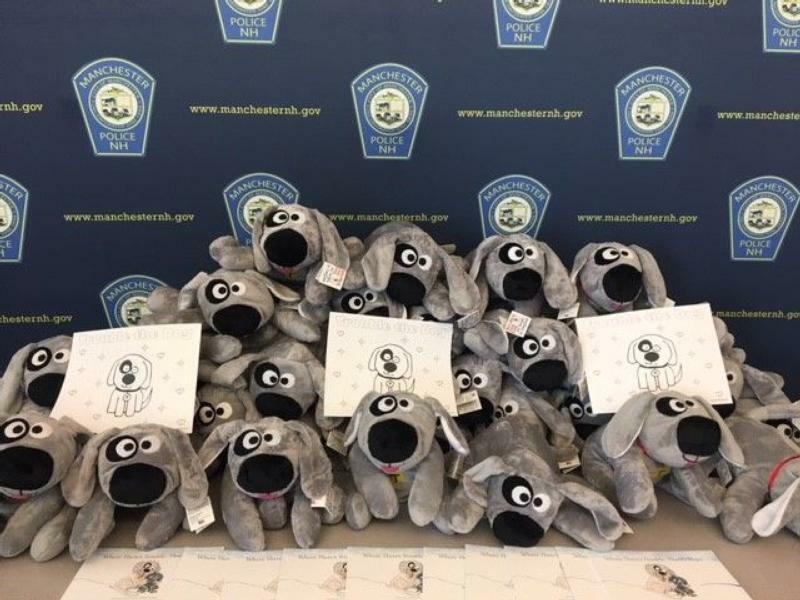 Available to give at the moment a crisis hits, these children will now receive plush Trouble dogs and beautifully illustrated children's books as a source of immediate comfort in the event of an accident, fire, domestic situation or other emergency. "There is little that is more important than our children," said Manchester Police Chief Nick Willard. 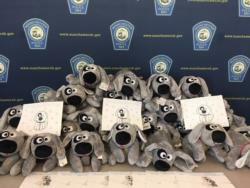 "The impact of [NH Speedway Children's Charities and The Kennek Foundation's] generosity to provide us many stuffed animals named "Trouble" to give to kids is beyond description." The Kennek Foundation provides a source of comfort to children in crisis through the character they created known as Trouble the Dog. The plush version of Trouble provides a source of immediate comfort to children who are frightened or hurt. They are used to help children who have experienced a tragic event and help them to cope and begin the healing process. "Through our collaboration with The Kennek Foundation, we have seen the amazing work the Manchester Police Department does with children and want to continue to support these important efforts in our community," said Hillarie Scott, Director, NH Chapter of Speedway Children's Charities. In 2017, the NH Chapter of Speedway Children's Charities donated more than $220,000 to deserving charities throughout NH. Since its inception, the New Hampshire Chapter has distributed close to $1.5 million, supporting nearly 300,000 children throughout the northeast. These funds are distributed in the form of grants to organizations like The Kennek Foundation that meet the direct needs of children. For more information about Trouble the Dog, visit: www.troublethedog.net. To learn more about the corporate program to deliver Trouble Dogs to children in foster care, visit: troublethedog.com/initiatives/.